The injury woes are piling up quickly for the New York Yankees early in the season. Just hours after placing Giancarlo Stanton on the Injured List, third baseman Miguel Andujar joined him. The young third baseman has been diagnosed with a small labrum tear in his right shoulder, an injury that could turn out to be serious. Andujar will receive treatment on the shoulder for two weeks and then be re-evaluated. It’s possible that rest and rehab alone could be enough to heal the injury. However, surgery to repair the labrum tear is also a possibility. 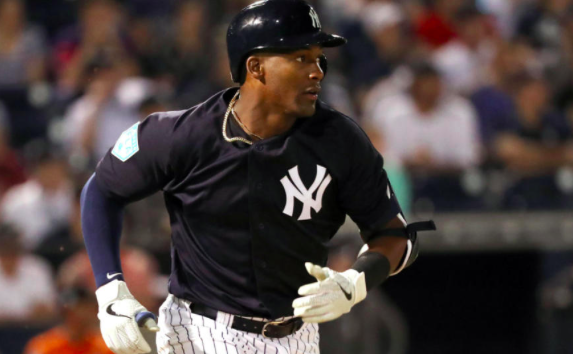 If Andujar needs surgery, it would mean the end of his 2019 season. Even if he can avoid surgery, it’s unclear how much time he’s going to miss. Andujar hurt the shoulder Sunday while sliding awkwardly into third base after a snap throw to the bag by Baltimore catcher Pedro Severino. He stayed in the game and didn’t show any ill effects initially. But when Andujar was absent from defensive drills before Monday’s game, he was sent for an MRI that revealed the tear. With Andujar is out, DJ LeMahieu will likely become the team’s primary third baseman. The Yankees signed LeMahieu to be a roving infielder who could see time all over the field, but now he’ll be tasked with being the everyday guy at the hot corner. Meanwhile, Tyler Wade was called up to take Andujar’s spot on the roster. He will serve as the club’s backup infielder. Even with a proven big league hitter like LeMahieu stepping in for Andujar, New York’s lineup is still hurting at the moment. Andujar hit .297 with an OPS of .855 last season, becoming an important part of the lineup. He had been hitting 5th in the order early in the year. Now he and Stanton, who hit 3rd the first weekend of the season, are both out of the lineup. Aaron Hicks is also on the DL to start the season, as is Didi Gregorius, who will miss at least the first half of the season. With all of the injuries, this is not the lineup the Yankees envisioned having when they opened spring training. Obviously, the Yankees still have some intimidating figures in their lineup, most notably Aaron Judge and Gleyber Torres. But the team’s depth is being tested in a big way right now. With Andujar’s injury, they can only wait and hope for the best. In the meantime, the Yankees need to hope some of their complementary players can step up while waiting for the cavalry of Hicks, Stanton, and possibly Andujar to return.